The meeting will be held at the Institute of Astronomy, Geophysics and Atmospheric Sciences of the University of São Paulo. The institute is located at Rua do Matão, 1226 (Cidade Universitária). Please see map below. Registration is now open. There will be no charge for attendance, however the cost of the bus transport (optional) is BRL 30 (about USD 15) for the entire Interop, and the cost of the banquet is BRL 130 (about USD 65). See who has registered so far (not updated in real time). Important: registration deadline is Oct 14th. 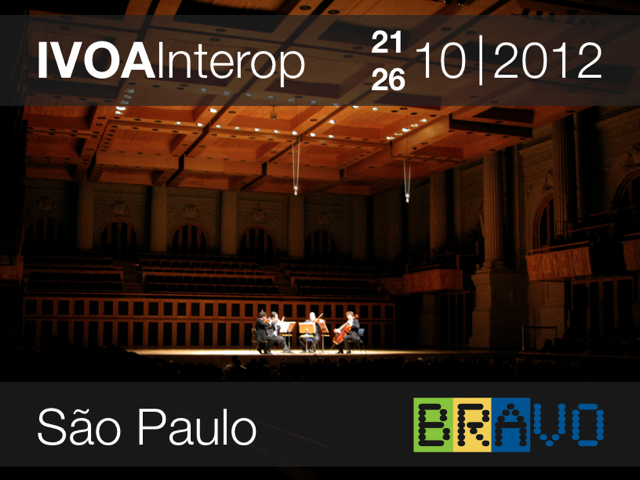 The interop banquet will take place at the Fogo de Chão Restaurant, located at Av. dos Bandeirantes, 538. The banquet starts at 8pm and the cost is BRL 130, payable at the restaurant. This place offers traditional Brazilian barbecue. In addition to the barbecue there are several side dishes (some of them vegetarian) and a salad buffet. Participants are encouraged to form groups of 3-4 to share taxis to the restaurant. The most convenient way to reach São Paulo is to fly directly to the Guarulhos International Airport (GRU). There are direct flights to GRU from most large cities of Europe and US. There are several shuttle bus lines connecting the airport to the city of São Paulo. The terminus of the Guarulhos / Faria Lima line (see yellow pin in the map below) is within walking distance of the hotels. The departure times from the Guarulhos Airport are: 06:00 - 07:30 - 09:30 - 11:00 - 13:00 - 14:30 - 16:30 - 18:00 - 20:00 - 21:30 - 23:30. Alternatively, you can go with to the hotel by taxi. The cost is about USD 70 and can be paid in advance by credit card in a booth just outside the airport doors. There will be two buses available to transport the participants from the Itaim district to USP in the morning and back in the afternoon. The buses will depart from the hotel Tryp Itaim located at Rua Manoel Guedes, 320 at 8h45 and back from USP at 18h15. IMPORTANT: there will be no passenger control, which means the buses will not await for you. Please try to be in place at least 5 minutes in advance. We recommend the hotels listed below, located at the Itaim district. These hotels are marked in the google map, below (red pins) . Click on the pins to get more information. The blue pins indicate alternate, but more expensive, hotels. Some hotels are offering special rates for the INTEROP (see below). Prices: ~USD 130 for single occupancy and ~USD 95 (per person) for double occupancy. Special prices for the interop. Be sure to mention INTEROP-USP in your reservation email. Prices: ~USD 120 for single occupancy and ~USD 80 (per person) for double occupancy. Best prices when booked via booking.com. Prices: ~USD 110 for single occupancy and ~USD 65 (per person) for double occupancy. Note: a 5% service tax will be added to the rates above. Citizens from South America: No visa is required. Citizens from the European Union: No visa are required for Brazil for touristic purposes. American Citizens: Brazil requires U.S. citizens to carry a valid U.S. passport and a visa when traveling to Brazil for any purpose. You must obtain your Brazilian visa in advance from the Brazilian Embassy or consulate nearest to your place of residence. There are no "airport visas" and immigration authorities will refuse entry to Brazil to anyone not possessing a valid visa. For more information see here. At Itaim: the hotel area (see map) is one of the gastronomic quarters of São Paulo, full of restaurants for all budgets.